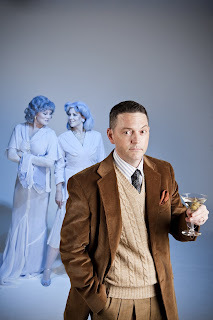 A boisterous, joyous theatrical classic comic play, Blithe Spirit centers on a man being haunted by the ghost of his first wife, Elvira, following a seance, and her continued (and increasingly desperate) efforts to disrupt his current marriage. With a truly ingenious plot, this comedy guarantees a large dose of delightful hilarity to all audience members. I was paged to the executive assistant's desk the other day and what did I find when I got there? A severed cow's head being pulled out of a box! Technically I guess it's a bull's head but, trust me, it really doesn't matter. Either way it is a pretty gross rendering of the real thing. Why, you ask, is the Playhouse having bloody fake animal parts delivered? It's all because of a little show we're doing February 20-March 29 called Bat Boy-The Musical. It's a silly and strange musical I've been looking forward to since the day I read the script. I can't wait to see how Carl Beck, the director, brings these outrageous characters to life. I also can't wait to see what Bat Boy looks like! As one of the employees in the administrative offices, I'm not privvy to what's happening in the Playhouse's artistic world until it starts happening. Needless to say, I get excited when I see the cast list or catch snippets of a rehearsal and I am always amazed at the talent of our staff and technical apprentices when I take a jaunt downstairs to the scene shop, paint shop and costume shop. It's great fun to see all that goes into making a production come together to appear on one of our stages. I hope you plan on seeing Bat Boy if it appeals to you and if not, hey, we've got Blithe Spirit running in our Mainstage Theatre through February 15. Classic Noel Coward--can't go wrong with that!! No, this show is not about baseball! It's a campy musical comedy inspired by a Weekly World News story about a bat boy discovered in a West Virginia Cave. What should you expect? A bizarre story line, hilarious lyrics, and a talented cast and orchestra. Love the cult classic Rocky Horror? Enjoy the gore of Sweeney Todd? Miss the mayhem of Greater Tuna? Then you've got to see Bat Boy here at the Playhouse in our 210 seat Howard Drew Theatre. Tickets go on sale to subscribers February 3 and to the general public on February 10. Show runs February 20-March 29, 2009. The Playhouse's Costume Designer Featured in "Wacky Jobs"
Blithe Spirit Opens This Weekend! The Playhouse is abuzz with the typical sights and sounds of tech week: hammers pounding, paintbrushes brushing, sewing machines stitching, tech crew hustling, actors running lines and a lot of caffeine being consumed! It's crunch time for the Blithe Spirit cast and crew as the first audiences take their seats this Thursday evening for the Preview Performance and Friday for Opening Night. This classic comedy by Noel Coward is sure to make you laugh! For those of you who don't know, we have promotional pricing that happens during opening weekends. First is the Lucky 7 ticket for students. High school and full time undergrad college students may attend opening weekend performances for only $7!! Students should call the box office at 553-0800 or visit the box office in person to purchase a Lucky 7 ticket. Students must show their school’s student ID when picking up their ticket at the will call window. Each student is limited to one ticket. This will be the second production featuring $7 Sunday Night during an opening weekend of a Mainstage production. $7 tickets are available in person at the box office window starting at 4 p.m. this coming Sunday, January 25, for the 6:30pm performance. Cash and check are the accepted forms of payment. Seats are limited and are subject to availability. No advanced reservations are accepted for this special offer and it is not valid on previous purchases. The Playhouse offers these opportunities to make high-quality live theatre accessible to everyone in our community. We hope to see you at the Playhouse soon! 2009-2010 Producing Partner & 85th Anniversary Sponsorship Opportunities Now Available! The Omaha Community Playhouse is proud our 2009-2010 Season marks the 85th year of providing high-quality entertainment and educational opportunities to the greater Omaha community. Currently, the Playhouse is seeking corporations, foundations, organizations, and individuals interested in sponsorships during our 85th Anniversary Season Celebration. Opportunities include 85th Season sponsors, Producing Partner sponsors and Special Production Underwriting sponsors. Contact Alena Furlong, Development Director, at 553-4890 ext. 127 or afurlong@omahaplayhouse.com for information on sponsorship opportunities. The Omaha Community Playhouse relies on Producing Partners (show sponsors) to help defray the costs associated with producing our high-quality shows. These contributions are vital to ensure the show goes on! Please join the Playhouse in thanking these generous donors for their support. Susan Baer Collins, John Beasley present lifetime achievement award. Playhouse veteran Elaine Jabenis was presented a lifetime achievement award for five decades of winning stage performances.